Spray Foam Insulation - All You Ever Wanted To Know! Trained applicator applying spray polyurethane foam insulation in wall cavities. With the increasing cost of energy and a focal point on health and green environmental issues, builders, architects and other building professionals are recommending insulation materials to add exceptional performance value to construction projects. Spray foam insulation is still one of the best ways to significantly reduce energy costs not only in new buildings but also when renovating an older home. Modern spray foam insulation is a two-part mixture composed of isocyanate and polyol resin. These two chemicals come together at the tip of a gun to create polyurethane foam that expands and solidifies in place. It insulates and seals gaps and could be used as vapour and moisture barriers. It sticks to concrete, wood and other surfaces and is sprayed into wall cavities, crawl spaces, onto roof tiles, under basement slabs, around footings and even around heating equipment. It is used in new construction as well as for remodeling jobs, where there are existing walls with drywall already in place. Spray foam insulation can be grouped into two different types: open cell and closed cell. In open-cell foam, the blowing agent gas is not trapped by the forming cells that are not completely closed, but are broken and the small spaces within the foam are filled with air. Open cell foams typically weigh in at 0.4 to 0.5 lb./cu. ft. and it is not recommended for outdoor applications. Open cell is an excellent air barrier but does not provide any type of water vapour barrier. It is often used for interior walls because it provides sound reduction. Advantages of open-cell foam include cost effectiveness and its ability to be applied at any thickness in one single pass. Closed-cell foam incorporates an insulating gas (blowing agent) that is retained within the walls of the cells, which leads to the highly efficient insulating properties of the material. It has a smaller, more compact cell structure with perhaps the highest R-Value per inch available on the market. Closed cell foam insulation is much denser than the open cell and ranges in density from 1.7 lb./cu. ft. to 2.0 lb./cu. ft. and is a superb air barrier as well as a water vapour barrier. R-value is the term given to thermal resistance to heat flow. The higher the R-value of an insulation product, the more effective the insulation properties. For example, blown fibreglass typically has an R-Value of only R-2 to R-3 per inch, depending on compression, density and moisture. For characteristics of conventional insulation materials, please click on this link. Today’s spray foam insulation’s (closed cell) most important attribute is a claimed R-value of 6.0 -7.0 per inch, enabling it to provide more thermal resistance with less material than any other type of commercial insulation material. R-value is an important metric for insulation, but it’s not everything. The added benefit, the ability to air seal creating a custom airtight envelope within the building structure is also a significant factor in opting for insulating with spray foam. Let’s get down to what everyone wants to know. How much does spray foam insulation cost? 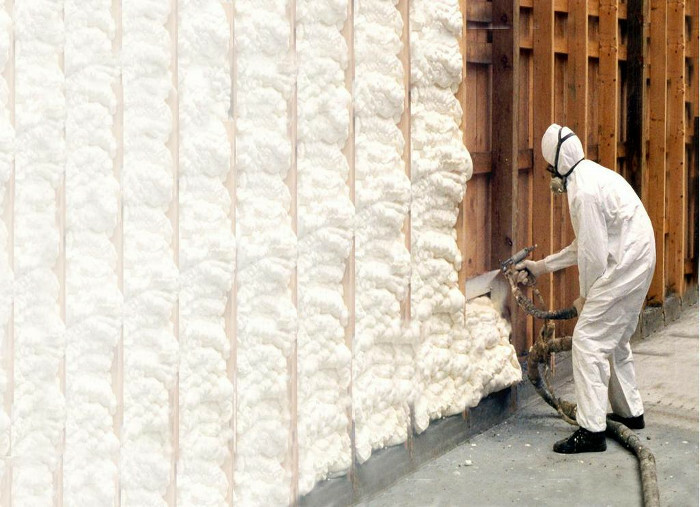 Spray foam insulation cost depends on its type and the amount of the applied spray foam. Also, there is a significant difference in cost when it comes to using spray foam insulation to a new or existing home. In general, figure the cost of spray foam at 3-5X more than the cost of fibreglass insulation. If everything is cleaned up and ready for the foam, it costs $1.00 to $1.40 per board foot for closed cell and $0.70 to $1.00 for open cell foam. A board foot is a volume measure that equals 1ft x 1ft x 1 inch. The total cost of an insulation project will vary, according to labor charges, the volume of foam layers required, wall thickness, and location. You will need a quote to see what your area rates are. For a quote in Southern Ontario, you can contact us at 705 533-1633. Not all green – Well-insulated homes are eco-friendly, but the insulation itself isn’t. Polyurethane spray foam products may contain soy, vegetable oil or recycled bottles, but they are primarily made of oil or petroleum. A CBC Marketplace investigation has found that when installed incorrectly, spray foam insulation can result in a strong, unpleasant fishy smell from off-gassing that has driven some people from their homes, some complaining of difficulty breathing and other health problems. In Ontario, a contractor must be trained, licensed and certified in order to install certain kinds of spray foam insulation. The product’s durability, one of its advantages over other types of insulation, can make it difficult to remove if it has been installed incorrectly. Since UV light degrades the foam, it always needs to be covered. If it catches fire, it releases toxic fumes, which can be harmful. Hydrochlorofluorocarbons are used as blowing agents, which is detrimental to the environment. I have used cans of foam to plug holes against mice in a well built storage shed. The mice chewed though the foam and used it for nesting. I ended up using steelwool & aluminum screen. Is there a foam product with cayenne pepper in it to discourage mice? A boat on the Trent Canal system puts cayenne pepper in the hull paint to stop zebra mussells. The foam you used was open cell foam. You should have used closed cell foam insulation. When is a fire barrier required? If i use it in a garage ceiling where my bedroom is over top or my attic space does it require a fire barrier? No, it does not require a fire barrier. However, since vapour barrier should be on the warm side of the bedroom floor, the easiest way to do that is to foam the spaces between the joists with closed cell foam insulation. This was a complete guide! Thanks for covering everything about spray foam insulation in detail. And the video was so helpful too! How does a person know they are getting the right product, and not one that would cause issues such as health or odor? Are there companies or products to avoid? Is there an agency that tests, and/or certifies the product and application? 2. Choosing the right installer! My home was built in 1977 and I am looking into insulating the crawl space basement with closed cell foam – do I need to redo the framing before spraying? Is framing even required when using closed cell foam spray? It is hard to judge without seeing the job. In general, you do not need framing for spray foam insulation.